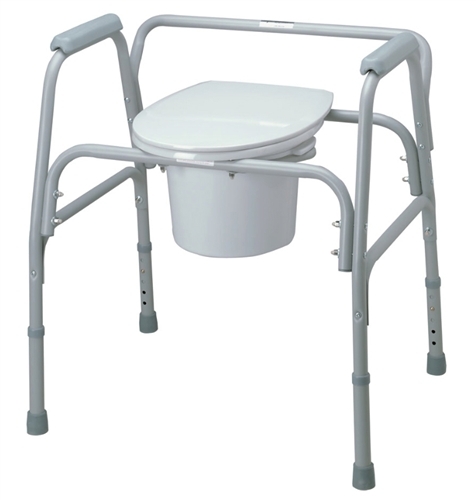 Medline Bariatric Rigid Arm Commode Chair has a 24” width between arms and a weight capacity of 650-pounds. The extra-wide seating area and higher weight capacities are ideal for larger patients. The seat is height adjustable from 18.25” to 23.5” and features a durable plastic seat with lid. It also has plastic armrests for additional patient comfort. 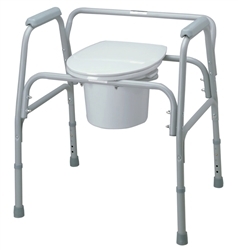 Comes with a 10-quart capacity commode bucket, cover, and splash shield.